Jane Austen is one of the most widely read and revered novelists in the English language, and her novels have become both literary and popular classics. Yet as a woman negotiating her cultures censorship of female ambition, Austen was secretive about her writing and expressed a genuine aversion to acquiring a public character. The title page of her first published novel, Sense and Sensibility, states that it was "By A Lady," and her relations who knew of her authorship were enjoined to keep the secret. 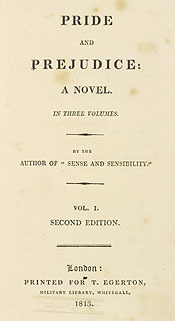 The title page of her next novel, Pride and Prejudice, attributed the work to "The Author of Sense and Sensibility," and this practice continued with each successive novel. Pride and Prejudice: A Novel. By the author of "Sense and Sensibility.".... London: Printed for T. Egerton, 1813.